MPR recently ran a piece describing the issue of mining may have on the upcoming elections. The story cites our research, and then goes on to describe the positions politicians have staked out on mining, whether for, or against. Last week, when I scheduled this piece to run on our website, I figured this piece would still be timely by today, but the Minnesota Department of Natural Resources decided to throw a wrench in my plan by granting PolyMet a permit to mine for it’s NorthMet project, significantly changing the way mining may impact the way people view the mining issue when they head to the ballot boxes tomorrow. With PolyMet approved, Twin Metals may now become the litmus test for whether candidates favor more mining in Minnesota. You can listen to the audio and read the story below. Copper-nickel mining has been a key political issue for the past several years in northern Minnesota, but it’s taken on new, broader prominence this year as the state inches closer to opening a proposed mine on the Iron Range, and as concerns over the environmental risks of copper-nickel mining continue to percolate. The controversy has also been inflamed by a recent Trump administration decision to cancel an environmental study on mining near the Boundary Waters. The move breathed new life into a project proposed by a mining company called Twin Metals, which is pursuing a potential underground copper-nickel mine on national forest land within the Boundary Waters watershed. What has long been an issue situated squarely on the Iron Range and in northeastern Minnesota has made its way into the statewide conversation — and onto statewide airwaves. Just this week, amidst a deluge of political ads blanketing Minnesota’s television screens this election season, two environmental groups launched a commercial featuring Carl Madsen, a former union electrician who now co-owns a lodge and outfitters next door to the Boundary Waters. The commercial supports Tim Walz, Democratic candidate for governor. And it opposes the proposed Twin Metals copper-nickel mine outside Ely, just south of the Boundary Waters Canoe Area Wilderness. The Friends of the Boundary Waters Wilderness is one of two environmental groups behind the ad. It created a political arm to provide $20,000 for the commercial. It’s the first TV spot the group has supported in its more than 40-year history. “We’re involved in it now because the stakes cannot be any higher right now; the threat to the Boundary Waters is direct and immediate; and time is of the essence right now,” said executive director Chris Knopf. Knopf and many of his fellow environmentalists are worried that mining on the edge of the Boundary Waters risks polluting a treasured wilderness area and threatens the region’s outdoor recreation-based economy. “It’s really critical that Minnesotans understand that the Boundary Waters is on the ballot this year,” said Jeremy Drucker with the Boundary Waters Action Fund, the other group behind the ad. He and his colleagues are hoping voters choose elected officials who will prioritize protection of the wilderness. Meanwhile, another ad (ours) that’s been airing since Labor Day trumpets the economic potential of copper-nickel mining in Minnesota. “Let’s protect the environment, let’s create jobs, let’s grow Minnesota’s economy,” several people argue in the commercial. The Twin Cities-based Center of the American Experiment produced the ad. The group is spending more than $270,000 on the campaign, which also includes a report predicting that copper, nickel and other precious metals mining could give a $3.7 billion annual economic boost to the state. “A big theme of our project is that mining is important not just to northern Minnesota, but for all of Minnesota, and developing these mineral resources will be of great benefit to the entire state,” said the group’s president, John Hinderaker. And, he argued, that can be done while also protecting Minnesota’s environment. “Modern mining can be done and is being done in an environmentally friendly way,” Hinderaker said. When it comes to mining and Minnesota politics, the differences among candidates often come down to nuances. 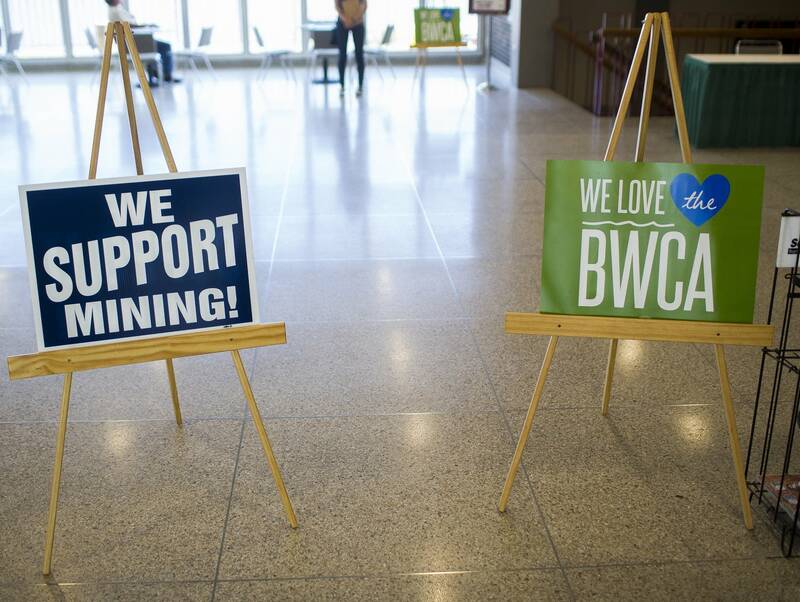 Many candidates, both Republican and Democrat, say they support copper-nickel mining projects, but only if the proposals pass muster with both state and federal environmental regulators. Many Democrats running in Minnesota have opposed the Trump administration’s move closer toward mining near the Boundary Waters, including Walz in the governor’s race and Joe Radinovich in the 8th Congressional District — which covers the Boundary Waters and the state’s Iron Range. But so did a Republican, Erik Paulsen, who’s in a tough re-election fight in the 3rd District, which covers Minneapolis’ western suburbs, more than 250 miles from the Boundary Waters. He even made his first commercial after the primary about the issue. “When President Trump tried to take away important environmental protections for the Boundary Waters, I said no way. I’m for mining, just not there, it’s too special, too important a place,” Paulsen said in the ad. The commercial allowed Paulsen to distance himself from President Trump and to showcase his support for the Boundary Waters, said Hamline University political scientist David Schultz. But it can be a trickier issue for Democrats, especially those running statewide, said Schultz, who have to appeal to pro-mining union workers in northern Minnesota as well as environmentalists, mainly in the Twin Cities. Democratic candidates like Walz in the governor’s race and Radinovich in the 8th District both say they support mining, but only if the proposed projects prove they can meet all environmental standards. Their Republican opponents — Jeff Johnson in the governor’s race, and Pete Stauber in the 8th District — say essentially the same thing. The nuance lies in the details. There are similar nuances in the gubernatorial race. Walz says if mining can be done safely, he will support it, but has called the Twin Metals proposal near the Boundary Waters “a different animal” than PolyMet, which is bordered by an active iron ore mine. Johnson says he believes Minnesota can have copper-nickel mining and still protect the environment, and says he’ll be an advocate in moving those mining projects forward. But come next Tuesday, mining and other issues may not be what end up ultimately swaying most voters. The question on the ballot, Schultz said, might go far beyond mining and the Boundary Waters, to something much broader.